Wherever you may be rentmen.eu will be your global place to find the best local men. Wherever you are, rent.men will be your global place to find the best local companion. The Spanish community already has its own place, now 100% in Spanish. Italy is not just about design and fashion. RentMen.it will give you another direction. Our users in Mexico are welcome to the new local RentMen space – rentmen.com.mx, where they also can use the Spanish version of the site. Are you from Brazil or going there? Go to rentmen.com.br and find the best guys to make your time well spent. RentMen in Puru is now rentmen.pe, also available in Spanish with our Spanish support. Columbian RentMen is simply rentmen.co and our users there also use the Spanish version of the site. India is among the most exotic places in the world, and rentmen is there to show you another side of it. Browse rentmen.in and visit the other side of India, where you’ve never been to. RentMen in China is a growing place for Asia and we give a special rentmen.cn for our users there. Bitcoin is digital money used for secure and instant transfer of value anywhere in the world. It is not controlled or issued by any bank or government - instead it is an open network which allows for much lower taxes. When you have registered to a Bitcoin provider you can add funds in your Bitcoin wallet and pay with it for various services, such as RentMen. Your bank statement will lead to your Bitcoin provider. 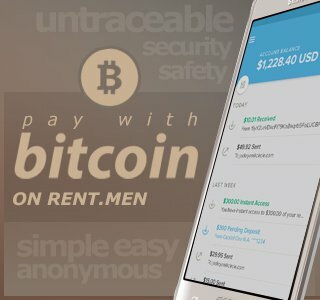 Click the button below to find out everything you need to know about Bitcoin payments on RentMen.